MP Ven. 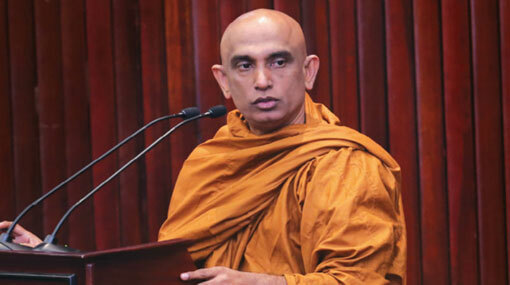 Athuraliye Rathana Thero says that an internationally accepted legal document should be formulated for the regulation of Glyphosate. Speaking at a conference held in Colombo yesterday (05), he said that there should be more support for public awareness programs on this matter. He states that, presently, there are 32 containers with Glyphosate waiting to be released at the port, and that these Glyphosate imported from various countries should be inspected via a proper regulating authority before being released. The thero got emotional while recollecting an incident he encountered related to the Glyphosate issue. According to him, a 20 year old man, whose father and uncle also died of kidney disease, was sent to India, by the help of the priest, for treatment of his kidney disease. However, the young man has died at the age of 28 due to the same disease. Rathana Thero says that hearing of such incidents is upsetting and yet the government has no policy regarding Glyphosate. He further said that it is regrettable that we are unable to discuss about something that is a matter of attention in the whole world. He says that there is no dialogue in the country regarding this issue due the lack of awareness among the public. He added that no politician in the country is currently addressing this situation. However, if the public is ready, this situation must be reversed, according to the Thero.